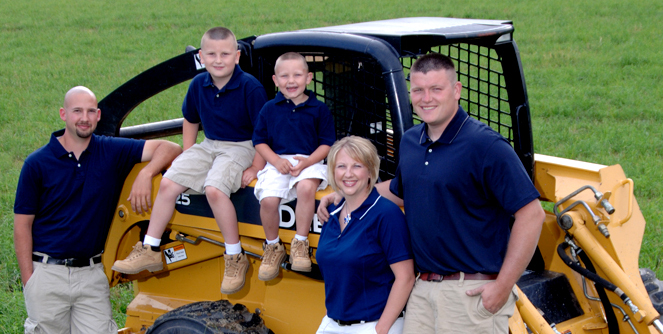 Bartter & Sons is an underground utility and excavating company, located in Ashland, Ohio. We are a local, family owned company that takes great pride in the work we do. Underground Utilities - We specialize in utility lines using underground piercing tools, eliminating the need to break pavement or destroy expensive landscaping. Drainage - If there is standing water in the yard because the water has no place to drain, we can use our laser to check the grade of the yard compared to the possible places to drain the water. Whatever is causing the water problem, we will get to the root of it and take care of it. Plumbing - Most people must hire two contractors -- one to do the outside excavation & plumbing, and another to do the inside work. With Bartter & Sons, we will handle any plumbing needs on your property -- both inside and out. Excavating - We handle both residential and commercial projects. Our mini-excavator is a huge benefit on many residential jobs. It can fit into many places that bigger equipment can’t. We also have a backhoe and skid steer for working on larger excavating jobs. Our excavating experience includes driveways, footers, and additions to name a few. Complete the form to the right to get a free estimate! We look forward to serving you. Copyright © 2019 Bartter & Sons, LLC.